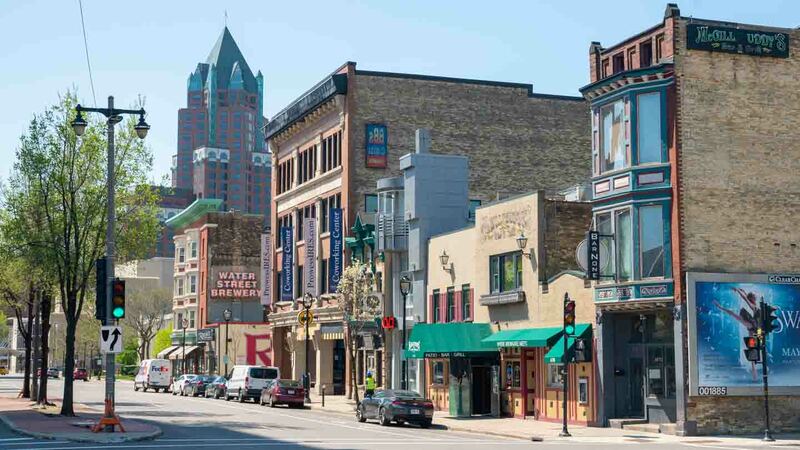 Water Street is one of Milwaukee’s most popular areas for nightlife. Roughly located on Water Street between E. Knapp Street and East Highland Ave., and along East Juneau Ave. between Water Street and N. Edison Street, the bar district offers plenty of choice and an easy destination for partying with friends. While there are numerous options to pick from, some definitely stand out from the rest for high-quality service, great food, and drink options, and for offering a guaranteed good time on Friday and Saturday nights. 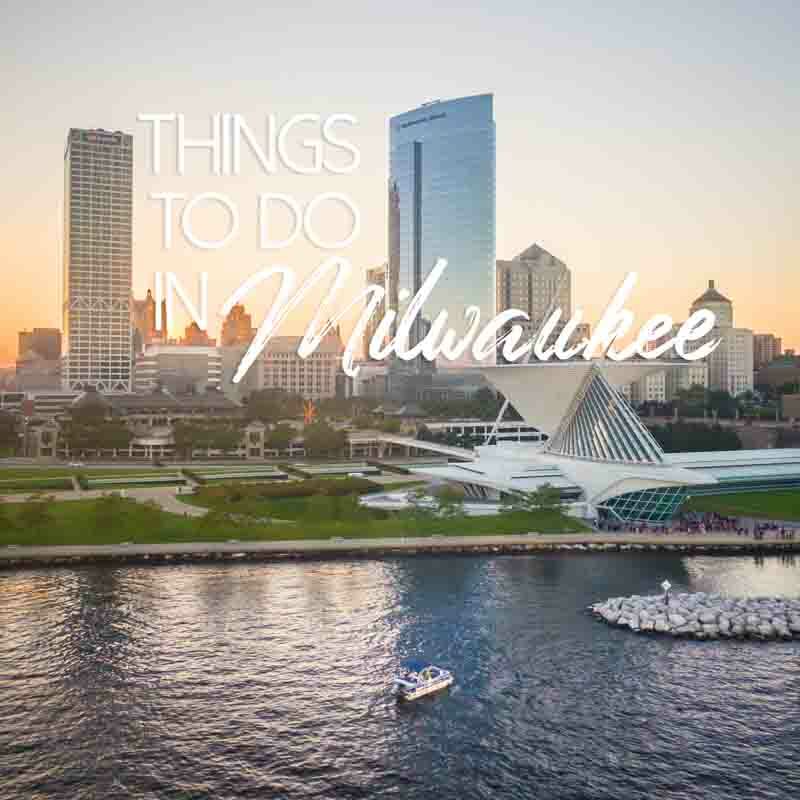 On any given weekend you are sure to find people out celebrating a bachelorette or bachelor party in Milwaukee on Water Street. Read below for a few of the top picks for Water Street bars. McGillycuddy’s has been a popular Milwaukee Water Street bar destination for over twenty years and doesn’t seem to be slowing down at any point in the near future. Whether for some quality bites or late-night drinks, this bar is an essential stop on any Water Street bar crawl. Be sure to enjoy their happy hour specials Monday through Friday 4:00 pm to 7:00 pm, which includes $1 taps, $2 specialty taps, $4 select cocktails, and $5 select appetizers. There are also daily specials on food and drinks such as $5 Reuben sandwiches on Tuesdays. 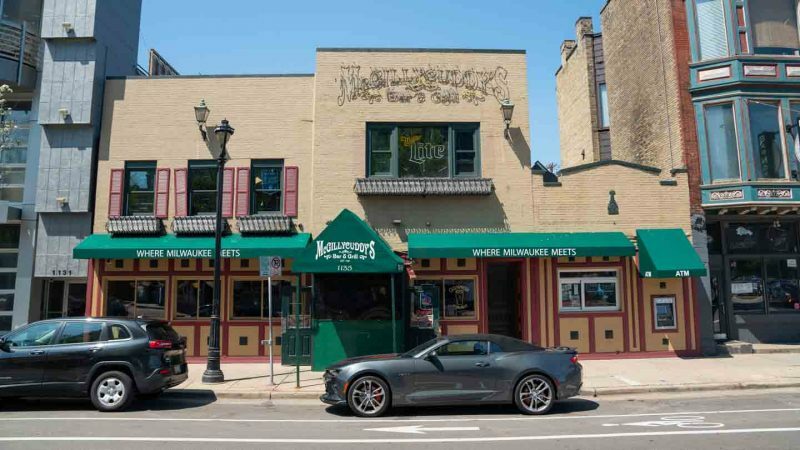 If you’re planning a bachelorette or bachelor party in Milwaukee a stop at McGillycuddy’s Bar on Water Street is a must. Open daily 11:00 am through 2:00 am. 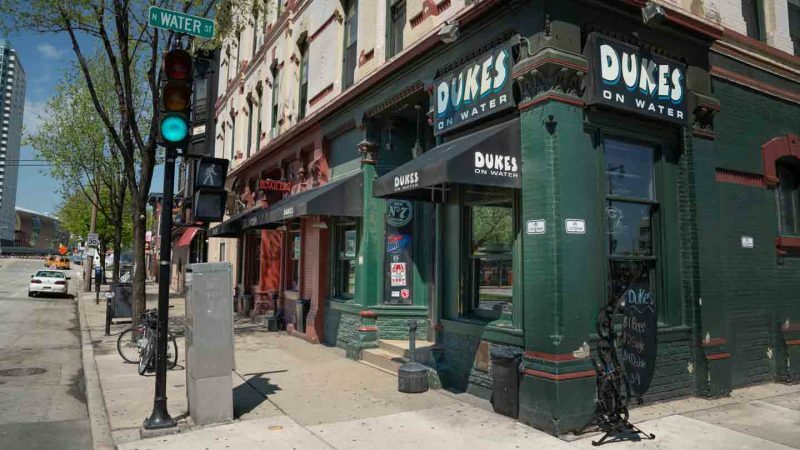 Dukes on Water is a destination dive-bar for Water Street partygoers. Especially on weekend nights and game days, you can expect Dukes to be crowded nearly to capacity. Other nights of the week are more laid back, but you can still get a great deal on a drink and enjoy playing some pool. You won’t find a cheaper beer in Milwaukee. Duke’s has the best happy hour on Water Street. Happy hour deals run Monday through Wednesday 3:00 pm to 9:00 pm, Sunday and Thursday 11:30 am to 9:00 pm, Friday and Saturday 11:30 am to 7:00 pm and include $1 domestic taps, $5 domestic pitchers, and $2 rail drinks. Duke’s is the perfect place to start the night and get a few drinks before continuing on to some of the other Milwaukee Water Street bars. Hours are 3:00 pm to 2:00 am Monday through Wednesday and Thursday through Sunday noon through 2:00 am or 2:30 am. BarNone is a small corner bar guaranteed to provide a good time. You can count on great bartenders, popular music, and nightly drink specials. Be sure to find a spot at the bar for an entertaining mix of bar dice and cheaply priced shots of your favorite liquor. Check out happy hour specials including two for one specials on rail cocktails and select pints. Red Rock Saloon is an ideal location for drinks, food during lunch or dinner hours, and live music. They have fantastic food and drink daily specials and stick around for live country-rock music nearly every weekend. 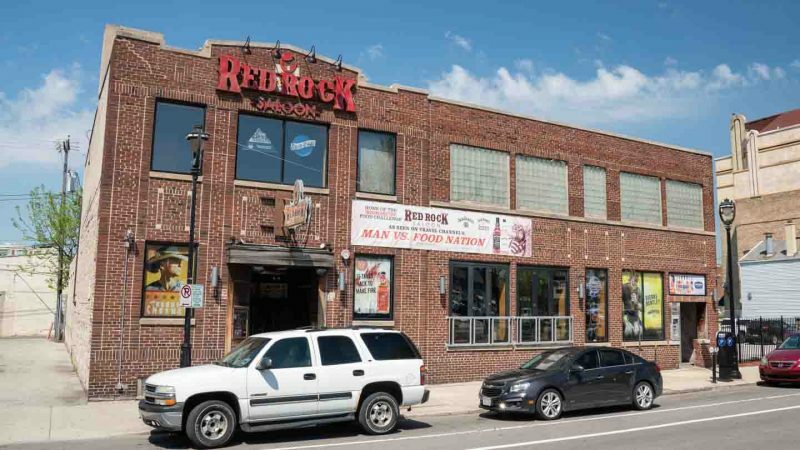 Whether you are trying the Nashville hot chicken ($10.59), the extensive bourbon offerings, or a fun night of Monday night trivia, you are sure to have a good time at the Red Rock Saloon. You can even try riding the mechanical bull, yes they have a mechanical bull! Happy hour specials are Monday to Friday 4:00 pm through 7:00 pm which offers half-off select taps and appetizers. Hours are Sunday through Thursday 11:00 am to 2:00 am and Friday and Saturday 11:00 am through 2:30 am. 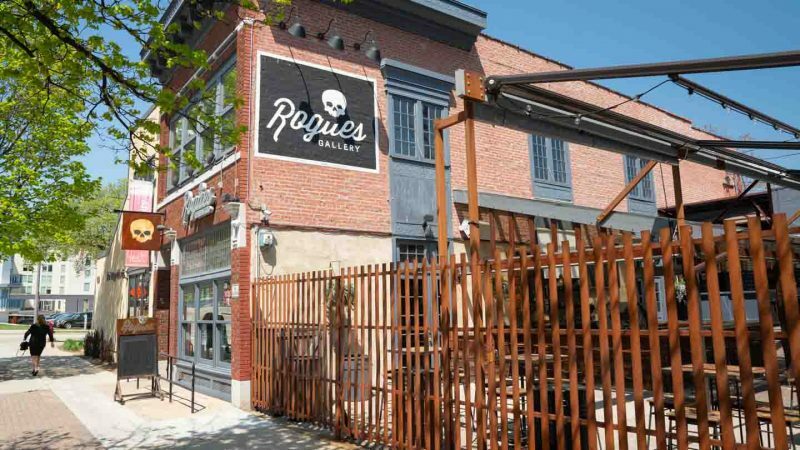 Rogues Gallery is a popular spot nearly every night of the week with daily drink specials. With two floors of bars and an extensive outdoor patio you can still manage to find a spot at this popular weekend destination. Be sure to check out the ordering window located on the patio for the next-door food truck Moto Burger. They offer corndogs and well-priced gourmet takes on burgers that are sure to please. If you can manage to go out on a Monday night, be sure to check out one of Milwaukee’s best service industry nights at Rogues Gallery’s famous “Bangarang” – a late night party with the city’s trendiest crowd of service industry insiders. Hours Monday 9:00 pm through 2:00 am, Wednesday 7:00 pm through 2:00 am, Thursday 5:00 pm to 2:00 am, Friday 5:00 pm to 2:30 am, and Saturday 7:00 pm to 2:30 am. Pourman’s offers a unique bar experience unlike any of its neighbors on Water Street. If you have ever wanted to try your hand at bartending, this is the place for you since Pourman’s is one of the only bars in the city to offer tabletop taps where you can pour your own beers (don’t worry, bartenders are on hand to offer assistance). The bar also has a wonderfully tucked away beer garden in the back perfect for enjoying the summer months. Check out Pourman’s Sunday to Wednesday 7:00 pm through 2:00 am and Thursday to Saturday 5:00 pm until 2:00 am.